Campbell Scientific's EC155 closed-path analyzer incorporates vortex technology for reduced maintenance, an absolute pressure sensor in the sample cell for more accurate measurements, and a sample cell with improved corrosion protection. The EC155 can be combined with the CSAT3A sonic anemometer, as shown in the main image. The revised CSAT3A has a more aerodynamic and rigid design. The EC155 is ordered as part of a CPEC300-series system (CPEC300, CPEC306, or CPEC310), which also includes the sample pump, data logger, optional valve module, and optional scrub module to provide a zero air source. The EC155 with anemometer simultaneously measures absolute carbon dioxide and water vapor mixing ratio, sample cell temperature and pressure, and three-dimensional wind speed and sonic air temperature. *Requires a CSAT3A Sonic Anemometer Head. Assumes the following: the gas analyzer was properly zero and spanned using the appropriate standards; CO2 span concentration was 400 ppm; H2O span dewpoint was at 12°C (16.7 ppt); zero/span temperature was 25°C; zero/span pressure was 84 kPa; subsequent measurements made at or near the span concentration; temperature is not more than ±6°C from the zero/span temperature; and ambient temperature is within the gas analyzer operating temperature range. Nominal conditions for precision verification test: 25°C, 86 kPa, 400 μmol/mol CO2, 12°C dewpoint, and 20 Hz bandwidth. 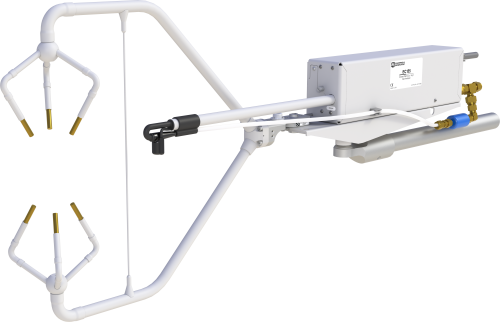 -NOTE- The accuracy specification for the sonic anemometer is for wind speeds < 30 m s-1 and wind angles between ±170°. EC150, IRGASON, or EC155: Which CO2 and H2O Eddy-Covariance System Is Best for My Application? Watch the Video Tutorial: Updating the EC100 Operating System. Why does the EC155 require a barometer? The EC155 requires a barometer for several reasons. First, the EC155 calculates CO2 as a concentration, and these values must be multiplied by the air density to get the CO2 flux. Second, the closed-path analyzer measures the number of CO2 molecules in the path and converts them to a concentration. This conversion requires a measure of sample cell pressure, which in older EC155 models (serial numbers less than 2000) is the sum of the barometer and differential sensor. In newer EC155 models (serial numbers 2000 or greater), this conversion still requires a measure of sample cell pressure, but it is done with an absolute pressure sensor in the sample cell. Finally, the EC155 has been calibrated at the factory over a range of barometric pressures. How does the EC155 perform during precipitation? Precipitation can block the infrared beam of an open-path IRGA—primarily through accumulation on the windows and by falling through the measurement path. The EC155 is a closed-path IRGA that is protected from rainfall by taking its measurements within a sample cell assembly. Older EC155 models (serial numbers less than 2000) have a heated intake assembly with a rain diverter to prevent precipitation from entering the sample cell. Newer EC155 models (serial numbers 2000 and greater) have a heated inlet and vortex intake (U.S. Pat. No. 9,217,692), which significantly improve performance during precipitation events and in conditions of high particulate concentrations, such as dust storms. However, measurements from sonic anemometers can also be affected by rainfall, especially if droplets accumulate on transducer faces. Therefore, it is important to continue monitoring data during rainfall events to ensure quality measurements are included in final calculations of flux. Can molecular sieve be used in the future to replace bottles for gas analyzers sold before July 2017? The molecular sieve is a direct replacement for the old magnesium perchlorate bottles. The molecular sieve may be used for any Campbell Scientific analyzer that used the old bottles. Why did Campbell Scientific start using molecular sieve? Does it have the same effect as the previously used chemicals? It was a safer alternative than using the previous chemicals. Increased shipping regulations for the chemicals limited the number of suppliers. Why was the EC155 design revised? Newer EC155 models (serial numbers 2000 and greater) take advantage of the new vortex intake technology (U.S. Pat. No. 9,217,692), which significantly reduces the frequency of maintenance required, especially in dustier, more polluted conditions. The new models also have an absolute pressure sensor instead of a differential one, which improves the pressure measurements. Finally, the new design uses a stainless-steel sample cell, which provides added protection against corrosion.